Here are a few questions you may want to go over with your partner and coach. 1) Do you like to play the add side or the deuce side? 2) What would you like me to say or do after you miss an easy shot? 3) What would you like me to say or do after you make a double fault? 4) Do you want to use signals or not? 5) Who do you think should serve first when we play? 6) Do you like a partner that is expressive and intense or quiet and reserved? 7) Which one of us should be reponsible for questioning bad calls? What should our plan “A” be when we play? 9) What should our plan “B” be when we play? 10) What should our plan “C” be when we play? 11) How much time after a loss would you like to wait before we discuss the match? 12) What can I do on the court to keep your confidence high? 13) Who should serve into the sun if it is in a bad spot? 14) What kind of warm-up do you prefer? 15) Do you like to hear advice or coaching from me while we are playing? 16) Do you want me to walk to the baseline between points with you when you are serving? 17) What is the best thing for me to say to you when you are getting mad or frustrated? 18) Should we always elect to receive (or serve) when we win the toss? 19) Are there certain people that will make you play better (or worse) if they are watching? The wind is not an equalizer. It favors the player with the most tactics available to use.(slice,spin,chips,etc.) This is usually the stronger and mentally tougher player. You should take many more steps for last second adjustments to the ball. Put more pace and topspin on your groundstrokes so that the wind does not affect them as much as a slower ball. Figure out which way the wind is blowing and lob into it so that the wind keeps your lob in the court. Let your opponents worry about hitting overheads in the wind. If you have a great serve or overhead think “not today”. In the wind put the emphasis on control and consistency. 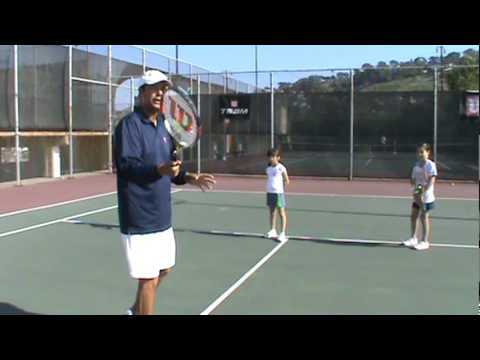 On your serve use a lower toss and more spin, on your overhead let more of them bounce. Put more first serves into play so that you only have to look up into the sun once. Stay back more when the sun is in your face. That way you will not be forced to hit overheads while looking into the sun. Adjust your service stance, toss, or positioning along the baseline to keep the toss out of the line of the sun. Lob more frequently than normal, so your opponent has to hit overheads looking into the sun. Use drop shots and lobs as a game plan. Be mentally tough. Don’t let your opponent know the sun is bothering you. Stay out of the sun as much as possible before and after your matches. Make sure you are properly hydrated before the match begins. Then, drink at least 4-8 ounces on every changeover. Waiting until you feel thirsty, is too late. Use the full 25 seconds between points to recover and towel off. Play with aggressive tactics that will ensure shorter points. Realize that your opponent is also very hot and exhausted. Always use the full 90 second changeover to sit down and recover. You should never walk directly to the other side and start play without a rest. If you feel you are the more fit player, be prepared to play long points. Wear a wet and cool bandana around your neck to help you stay cool. The scoring system in tennis adds to the pressure of a player. Unlike other sports, there is no overall time limit. Play continues until one of the players wins two out of three sets. Consequently, there is no room for coasting on a lead or waiting for time to run out. Each player is always just a few points from a complete turn-around, and a lead is never safe. As a contrast, if a basketball team is ahead by 30 points, they will almost certainly win because their lead is too large to overcome within the time of the competition. In tennis, a player can be ahead 5-0 in the third set, and lose two games and immediately have reason to fear a loss and a huge comeback by their opponent. Another dimension of tennis is the fact that a nine-year-old child can compete against a 14-or-15-year-old teenager.A 20-year-old against a 30-year-old,a 40-year-old against a 60-year-old and on an on. Small can beat large,young can beat old and visa versa. 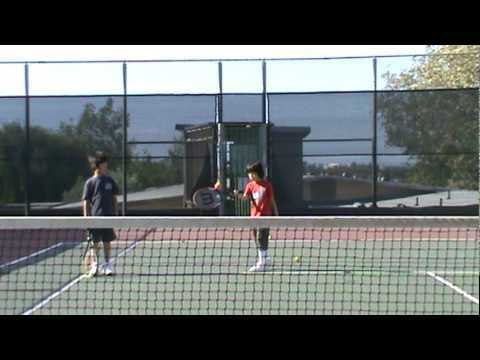 For the junior player, tennis training can be a very large expense for a family. The pressure from these expenses can add additional stress to young players who feel guilty for not winning because of all the money their parents are putting into tennis. Parents can lose sight of what is important and begin to expect a return for their investment. 1)Tennis Is an Individual Sport In tennis,(singles) you are alone on the court.No one shares in the glory or the blame. There is no teammate to pass off to if you are playing poorly, and you cannot be taken out of the game for awhile to recuperate from poor play. Tennis is one of the only sports where players are not allowed to receive any coaching. Except for high school tennis,Zonal teams, or Davis Cup,tournaments do not allow coaching. This restriction forces players to deal with the pressures and problems of play on their own. Many sports allow players to regain their composure or get back on track with substitutions and time-outs. This is not the case in tennis. Players must stay in the game, regardless of how bad or uncomfortable it may be. This is particularly difficult when matches last two to three hours in length. Changing temperature, wind, intensity of light, court surfaces, balls, and equipment add to the depth of the competitive challenge in tennis. Players are forced to deal with such changes, many times within the same match. Players responses to these situations can provide an indication of their level of mental toughness. Those who are not affected by changes in conditions are often the ones who win. Few sports require players to concentrate and perform for as much as three hours at a time. It is common for players to be required to compete in two singles or doubles matches in a single day. Mental toughness and physical fitness become critical if a player is to become successful.